As African Americans migrated in the 1920s and '30s, to the big cities of New York, L.A., Detroit and Chicago, artists like Cab Calloway and Count Basie popularized a new blended sound comprised of jazz and blues pioneering a way forward for record labels like Chess, Imperial and Atlantic. In 1948, RCA was marketing this unique sound when Louis Jordan had 3 of the top 5 songs on the R&B charts. As electric guitar became one of the most pronounced instruments, popularized by artist like Bo Diddley, used from the '50s to the '70s; R&B and Soul evolved using drums, bass, a couple guitars, piano and sax with popular artists like Chuck Berry, Ray Charles and Little Richard. Funk and new grooves were born during this era that are still prevalent today. Obviously enough... that's where the term Rhythm Section came from that most songwriters refer to today. Elvis brought new energy to R&B as he borrowed the style for his early records like Jailhouse Rock and brought new awareness to a white listenership and songwriters. Between the popularization of an emphasized back beat and popularity of '50s Cuban music grooves, Rock & Roll was born. Since the days of Motown and Philadelphia's blue eyed soul in the 60s, no sound has ever rivaled the groove and melodic beauty of Rhythm and Blues. A style that has evolved for nearly 100 years continuing on today in the era of HipHop, Urban and Rap. Download or License new songs inspired by this movement for your enjoyment or project needs...from seasoned songwriters. 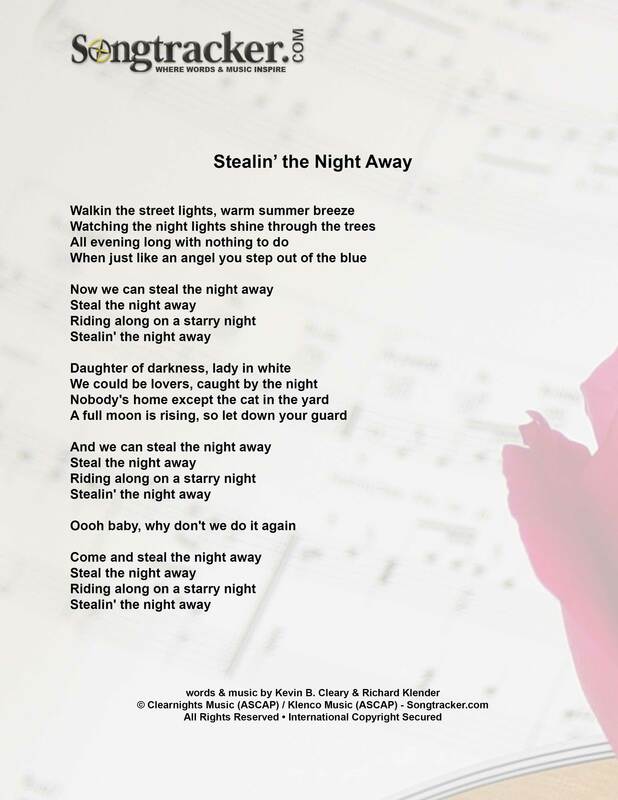 Printable lyrics are provided for your convenience.